Are you ready for the most truly outrageous show?! Be dazzled as Kiki transforms into her truly outrageous self! This all 80’s show is sure to keep you dancing, smiling and walking on sunshine! 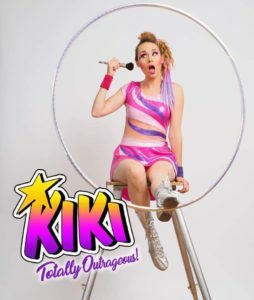 Come watch as Kiki does all of her best hula-hoops, contortion and acrobatics all to your favourite 80’s tunes! Don’t have a stage? Really want to include performances at your event? No problem! Kiki will dazzle your party as she roams around your event, interacts with your guests and helps keep the energy up throughout the night! Can I hire Kiki to perform a choreographed show? Yes! Anywhere from a 2 minute show to 10 minute performance. We will need to chat with you to get a few details about your event, your stage and your set up to help create the perfect entertainment! Kiki is happy to tailor her costumes to match your brand, colours, or current promotion.